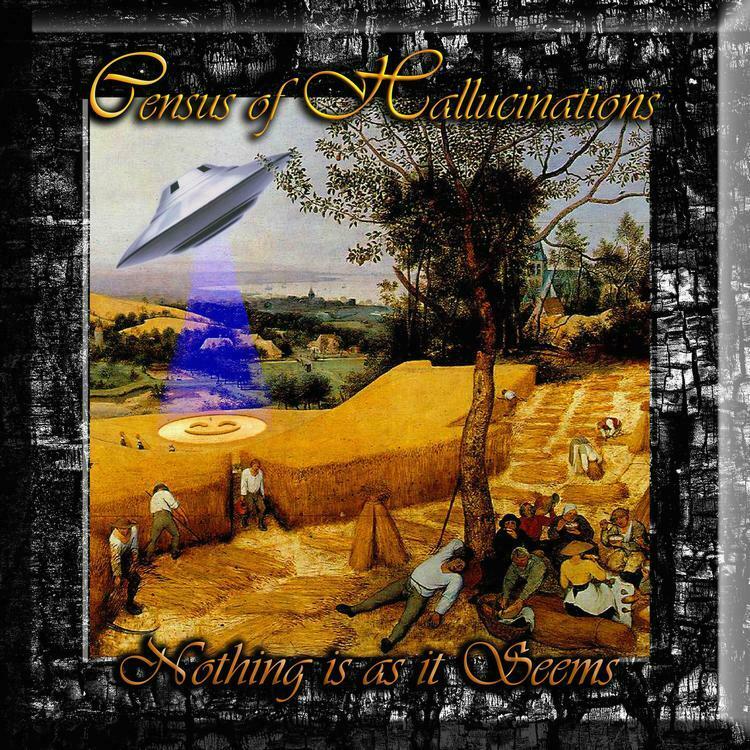 In late 2014, Census of Hallucinations (CoH) released Imagine John Lennon, a 4-song, 30 minute EP which was a precursor to the new full length album – Nothing Is As It Seems. Consisting of the four songs from Imagine John Lennon plus 5 new songs, CoH founder Tim Jones describes Nothing Is As It Seems as a book of musical short stories with a theme that links them together. Quoting from the press release, Tim explains: “I think that the key word here would be alienation. The deep sadness in the shocking discovery that this is in fact all there is. When you don’t fit into the mold and have had a lifetime of it. The constant hypocrisy both inside ‘The Game’ and out. The reality being presented to us by those that run this planet utilizing scientific ‘experts’ has us living in a Never Never Land, an illusion or even a projected holographic environment where the unfathomable beauty of the universe is denied to us. Cut off from the source of our reason for being here, we stumble around seeking guidance from fools”. Heavy stuff indeed. But that’s Tim, one of Rock music’s most articulate, sharp tongued, tell it like it is lyricists. Musically CoH have settled comfortable into their ‘MKII’ phase, which began in 2012 with the release of Dragonian Days, the band’s first album in five years, and started to take its current shape with the addition of veteran guitarist John Simms and vocalist/lyricist Maxine Marten on the following year’s Coming Of The Unicorn. The ensuing lineup proved to be such a tight knit unit and created such a uniquely beautiful sound that a phenomenally talented guitarist such as Tim laid his instrument aside starting with 2014’s The Nine, leaving all principle guitar duties to Simms and has focused on writing and vocals. That’s a big decision for a musician. But the result has been a sound that is still distinctly and recognizably CoH while always PROGressively forging ahead. The songs, melodies and lyrics are trademark CoH. Tim’s voice is unmistakable. Maxine Marten’s and CoH co-founder Terri~B’s backing vocals are dreamily surreal and downright lovely. The production and arrangements, both music and vocals, are accessible yet bewitchingly spaced out and even theatrical. And John Simms’ guitar imbues a cosmic Blues/Jazz style that represents the clearest new dimension aspect of the current CoH sound. I can’t emphasize enough the crucial interplay of music and vocals. Tim is “singing” in a part spoken word style with which he communicates the emotions the lyrics are trying to convey: sarcasm, mockery, whimsy, anger, pain and pure soul… you feel it all. Some of the best moments are when Tim is in full communicative mode, with Maxine and Terri as supporting vocal mystics, and John’s lusciously lyrical guitar seems to be handling the “singing” duties. The Stone Premonitions studio craftsmanship and attention to mix, stitch and arrangement detail is in full force as well, the result being the always impossible to pigeonhole CoH blend of Prog, Pop, Kosmiche, Jazz, Blues and Psychedelia. CoH excel at being wildly adventurous yet totally accessible. I haven’t called out individual songs but I’ll give honorable mention to Tim and Terri’s son James Jones who recites his poem Lost In The Lakes on In Ruins. These folks still sound like NO ONE else but themselves.